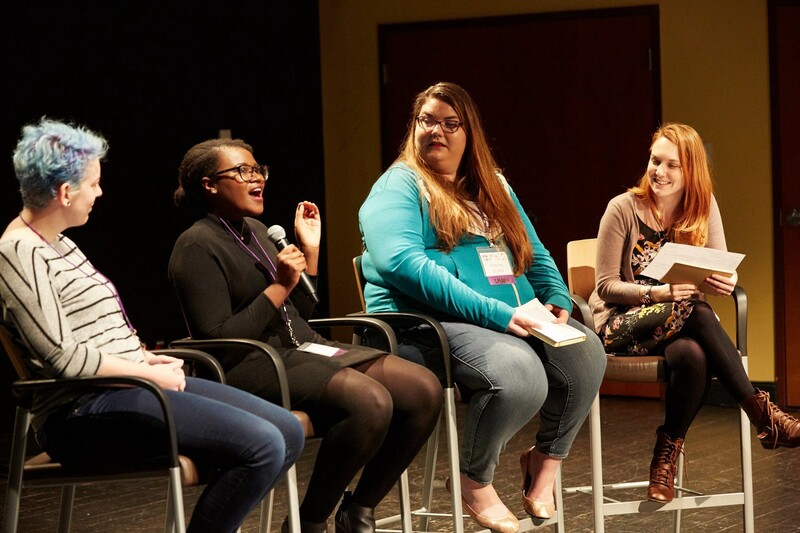 Ela Conf is a conference with a mission of empowering more women to be leaders in tech by providing a safe space and community to inspire and learn from one another. 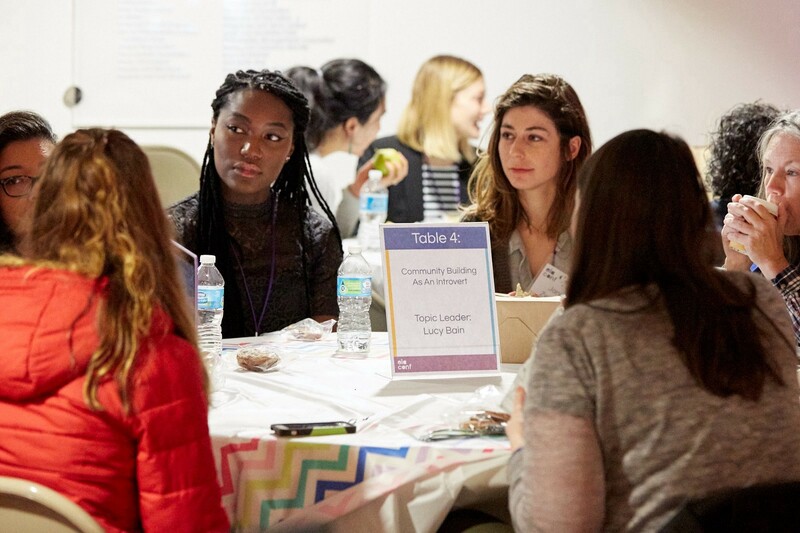 The event is volunteer run and is comprised of all women founders, organizers, volunteers, speakers, and attendees and has taken place in Philadelphia, PA for the past two years. We realized that there seems to be a disconnect concerning the reality of our budget and we decided we should be transparent about our challenges and struggles with organizing Ela Conf. Recently we collected numbers and stats from our 2015 and 2016 events to share our growth, how we raised and allocated funds, and to take a closer look into what goes into the event on a more personal level. In publishing these numbers we hope to better communicate our sponsorship challenges and shine light on our core values and priorities. This is so hard. Organizing this event has been one of the most difficult and rewarding projects for us. Most of what is involved in founding and organizing a community event like this is not always glamorous and can be very stressful. After experiencing an especially challenging time in 2016 with recruiting company sponsors, we have not stopped asking ourselves why this is the case. When we share our challenges candidly with others they are often shocked. Surely companies would jump at the chance to financially support women in tech! A conference with an important mission like this must be well-funded! Neither of these assumptions are true but they helped us realize that we need to talk about this stuff more openly. We all praise transparency at work, yet we had not been embracing that same philosophy into event planning and going forward this will be much different. A lot of these numbers are exciting as well, however, because they help show the incredible growth that has taken place in a very short amount of time and so we have published these stats as well. Our hope is that this transparency will help potential sponsors understand why we need financial support, what those funds go to exactly, and the positive impact it has on this growing community and event. We also hope that when everyone can see how limiting our budget is and how much of the work we do ourselves for free, then they may be less likely to wonder, for example, where their swag bag is. In seeing our budget, we are revealing our priorities. We do not put value into marketing items that will end up in a landfill, but we strongly believe that the cost of childcare should not prevent any mother from attending the event. 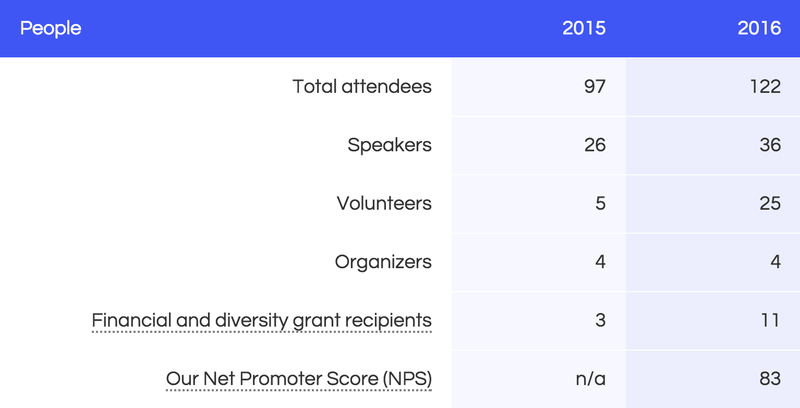 We’ve added the financial breakdown of the event on the site by highlighting our budgets, number of sessions, sponsors, call for proposal responses, and attendee turnout by year. You can compare items from 2015 and 2016 to see where we have grown and what our largest line items are. We deliberately kept the size of our conference smaller than most. One of the more consistent pieces of feedback we receive is that attendees love the intimate, personal vibe which is largely achieved through these smaller numbers. It could also quickly scale to be beyond what we could manage as volunteers without capping attendance this way. Last year we were committed to not exceeding 100 attendees and in 2016, having become a bit more comfortable with this organizer gig, we moved this cap to around 125. Our Slack remains active year-round, with the most used channel being #advice. Member numbers here have more than doubled in a year’s time. The goals squad that was organically created has grown from 5 to 15 members in this same timeframe and serves as a group where woman can meet up, share their goals, and encourage one another to meet those goals. The community’s response to our 2016 call for proposals blew us away, with 108 abstracts submitted; up from 27 in 2015. As a result of receiving this much interest and well thought out abstracts we adjusted our schedule to increase the number of speaking opportunities. The event begins on a Friday evening, which is a great way to casually get to know everyone you will see a lot more of the following day. 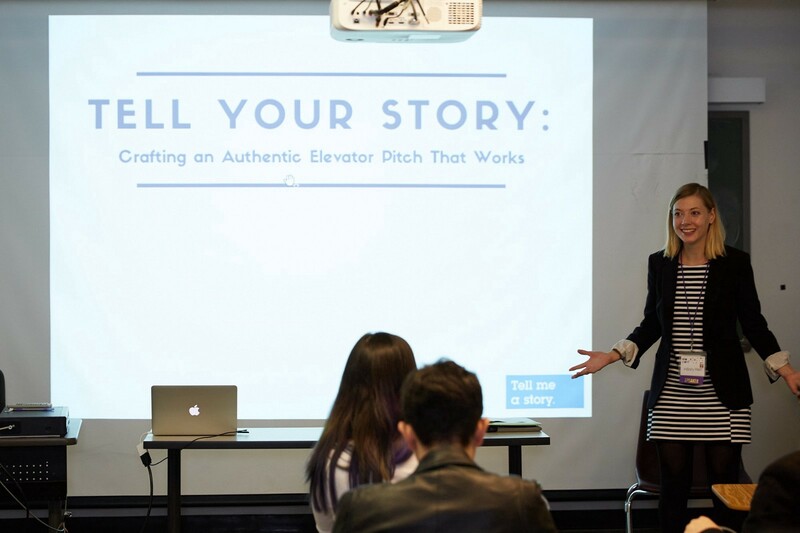 In 2015 this kick-off consisted of a few scheduled lightning talks with networking. To accommodate our influx in speaker abstracts we scheduled a series of twenty and five minute talks for this time instead. Friday evening had its own opening and closing keynotes but also included a bit of time to mingle. The main changes for Saturday in 2016 were that we offered more panels, breakout sessions, and even appointed lunch table topic leaders. Lunch table topics became a great way for the table leaders to share their abstract ideas in a conversational manner as well as a fun way to get to know other attendees and avoid that dreaded awkward lunch time moment when you are not sure where to sit or with whom to strike up a conversation with. We were excited about all the phenomenal, timely abstracts we received and made room for as many possible, but that all comes at a large financial cost for a number of reasons. After speaking with other event organizers, it’s clear that the bulk of their funds usually go to cover things like venue, catering, their website, marketing, and swag. While we either pay for these same items or tackle these essential tasks ourselves, such as branding, marketing, and our website, we also decided to take on an additional and necessary line item: speaker travel and lodging stipends. In addition to all these costs, we also provide childcare stipends and award grants to any woman that applies. While we would never expect volunteers, speakers, and grant applicants to pay for a ticket, these are tickets that cannot be sold and is a major factor in our dependency on raising sponsor funds. In total, we provided $5,576.59 in travel and childcare stipends for our speakers and attendees. We’re so proud that we were able to support anyone that asked for assistance, even if we weren’t able to fully fund their travel costs. We also spent more in 2016 on photography and videography ($3,039.51). We wanted to make sure we’re giving our speakers beautiful takeaways from their talk that they can then add to their portfolios and use to land more speaking opportunities. Food is clearly a very large line item as well so it may be worth mentioning here that we have always been limited contractually by venues to use their caterers, which leaves no room to explore potentially more affordable options. In 2016 we reached out to 149 companies asking them if they would like to financially support us and our mission to provide a safe, inclusive space for women in tech to learn from and inspire one another. We stayed up late and woke up early to research, make lists, and reach out to companies and individuals before and after work. After hours of lost sleep, countless weekends, and stressing over the very real possibility we may not raise enough funds to make this work, we were able to gain partnership from 14 of those 149 companies. In total from the 14 individual and 14 corporate sponsors we raised $18,832.80 for 2016. Those numbers are, frankly, hurtful and confusing. It’s incredibly difficult to raise funds for this event. 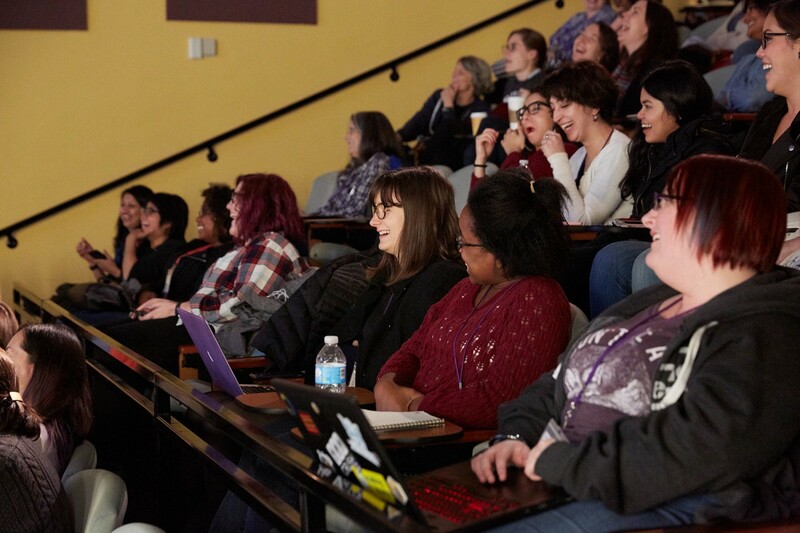 Even with the current endless talk about diversity, companies still aren’t doing enough to support women in tech, by either paying for their travel expenses to attend/speak at conferences like Ela, or supporting the mission directly. We raised $5,229.31 from ticket sales on 2016. 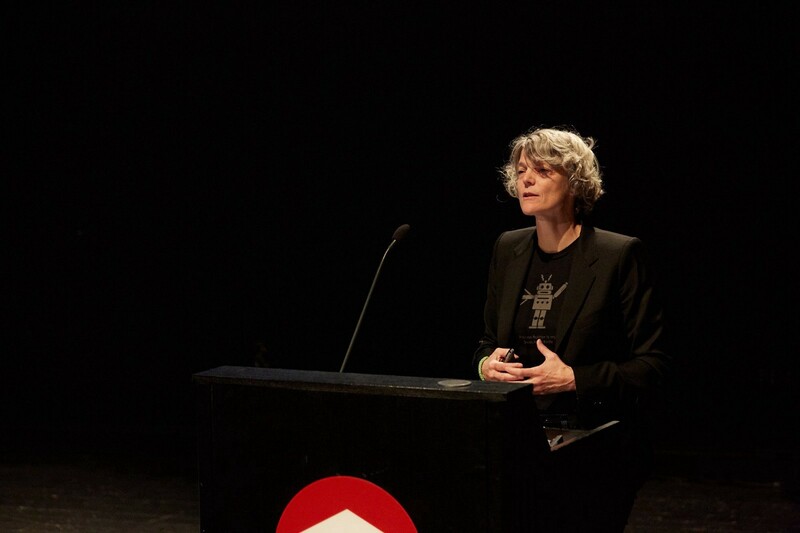 We also provided $5,801 worth of complimentary tickets to speakers, sponsors, volunteers and provided $1,440 worth in full covered grant tickets. It’s essential to us that we keep ticket costs on the lower-end and that no woman that wants to attend is presented with cost as an obstacle. While this is a fairly significant amount of money in sales and we simply couldn’t get by without it, we don’t receive these funds until weeks after the event takes place. This can often put us in a difficult situation because we are obviously unable to delay vendor payments as well, which we will touch on a bit more in a section to follow. We create a lot of speaking opportunities over a one and a half day timeframe and rely heavily on our volunteers. These complimentary tickets, however, add up especially fast when we are working with a maximum number of attendees around 100–125. This becomes one of the many reasons we depend on generous sponsors so greatly. One of the line items we’d like to mention is our fiscal sponsor, Girl Develop It (GDI). This partnership means that GDI manages our funds and makes vendor and individual payments on our behalf, which has helped us tremendously in so many ways. Having GDI as our fiscal sponsor, saves us a ton of time, allows our sponsors to make tax-deductible contributions as the organization is an established non-profit, and provides insurance coverage for the event. In return for their services, we paid a percentage of our profit ($1,203.11) to GDI. We also adore GDI and its mission. Many of us met through GDI meetups, and it’s how some of us got started with community work. Last year we donated all profits to the organization. We were so thrilled to be able to do this, with the only downside being that it didn’t give us the chance to have seed money for 2016. We learned very quickly in 2016 that seed money is necessary; venues often require a deposit in order to book, for example. Among the more shocking bits of information that we share is that we don’t get paid and we have to personally cover a lot of these expenses ourselves and then get reimbursed after the event. Yes, it gets scary. No vendor, of course, is willing to wait until the event is over to collect funds. In order to secure an appropriately sized and laid out venue, we need to begin researching venues in February and have contracts signed in the spring. As mentioned, we didn’t carry over seed money from 2015 for 2016 and found that many potential sponsors are not willing to make payments at the beginning of the year for an event that takes place at the end of the year. This all requires that we, the organizers, to make these down payments ourselves. We do this knowing we may not get reimbursed until the end of the year and only if we are in fact able to secure enough sponsors. This all, of course, sounds very risky. It is. When running community events you don’t have the security net that operating through a company would inherently provide. 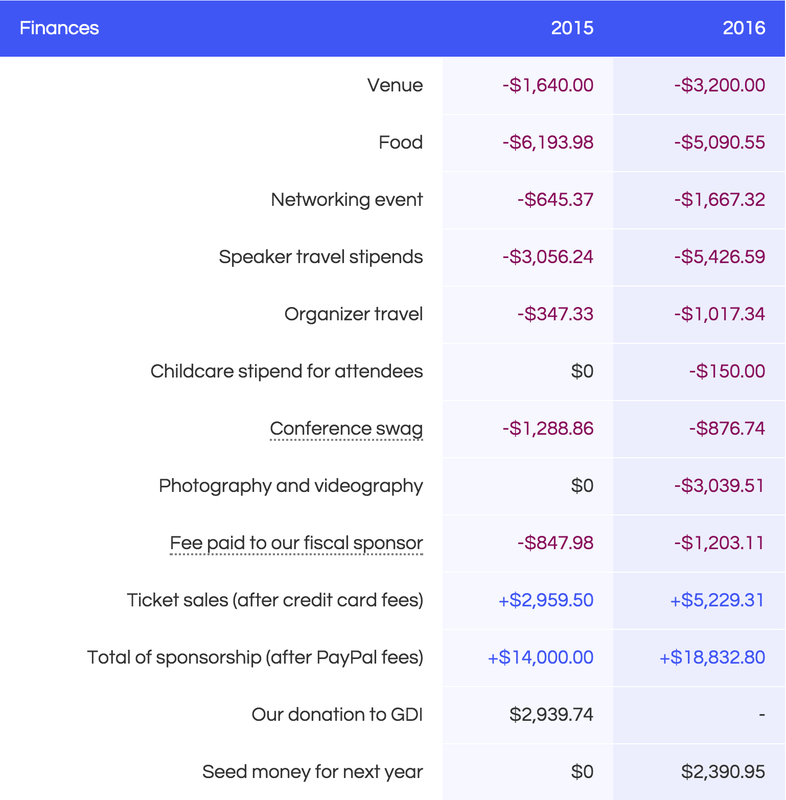 Rebecca Miller-Webster, founder of Write/Speak/Code, wrote a beautiful, refreshing post/rant about these not so awesome bits of financial reality when organizing community events earlier in 2016 as well. There are also significant contributions we make in the form of expertise and time. We are tech professionals. We are designers, developers, and product managers. We save a significant amount of money for the event by handling all planning logistics, the website, branding, and marketing on our own. But we are volunteers, and the cost to us comes in the form of time lost. Time that we could have spent on a paying project. Time that we could have spent with family and friends. We are often told that perhaps because this is all so damn hard proves that it is so needed. We hear that and agree that more than ever events like this are crucial, however, we would be lying if the reality of these numbers hasn’t made us question what we are doing and caused us to consider not doing this anymore; whether or not this is sustainable is a question we ask ourselves year-round. Our motivation ultimately comes from the countless stories we hear of women writing their first blog post after the event, finally asking for that raise they have been thinking about, applying to speak at their first conference, finding their refuge and friendships among their peers. We pour our time and hearts into this because it is a true passion project for all of us and a way for us to give back to the very space we work in, have learned from, and want to make a better place. However, realistically, this larger community that we’ve formed and the support we’re able to give to women to rise up against the voices that continually try and shut us down in this industry is simply impossible without enough funding. As we’ve risen in our careers, we want to ensure that every woman that enters into tech dreaming of a better future for themselves has the tools, strategy, and resilience that they need to survive and thrive in this industry. We ask that you take a look at our numbers and what people are saying about the work we are doing. 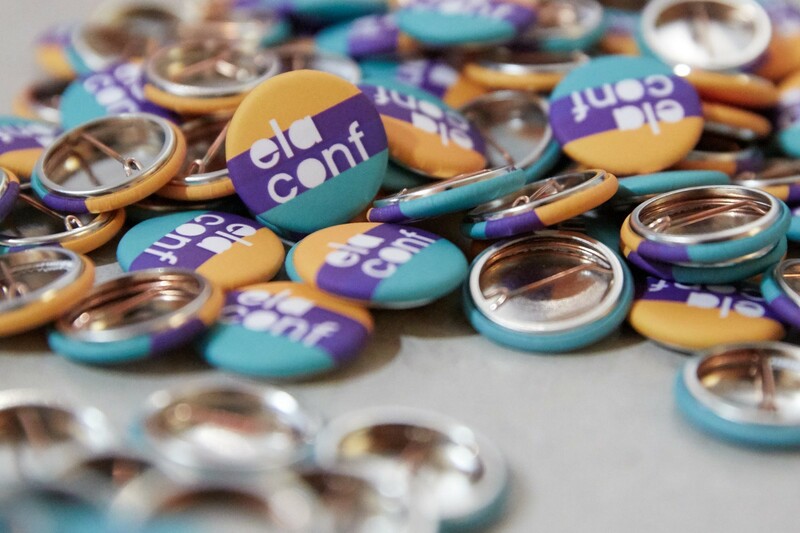 If your organization or company would be interest in partnering with us for 2017 please feel free to reach out via email (hello@elaconf.com) and we can chat. We truly cannot do this without you, which we have shown by publishing these numbers. In supporting Ela Conf, you’ll support that single mom that’s trying to find her voice and community — her squad. You’ll support that new developer that is just getting their feet wet, feeling overwhelmed, and not quite sure where to get advice. You’ll be part of the reason someone feels safe and encouraged enough to publish their first blog post or is ready to speak at a conference. Finally, you’ll support the organizers who work tirelessly to make sure that women in tech are provided with a platform and the tools they need to succeed and feel welcomed in this space that so often fails them.